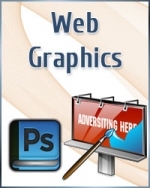 A web banner or banner ad is a form of advertising on the World Wide Web. This form of online advertising entails embedding an advertisement into a web page. It is intended to attract traffic to a website by linking them to the web site of the advertiser.